NOTE: As of June 2012 this website seems to be unresponsive. 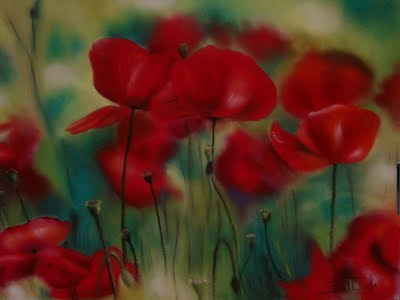 Bio: Françoise Pothier is a self-taught pastellist, a medium she has practised since 1990. She received her artistic training at the Ecole Bellecour in Lyon in the 1980s, where she learned perspective, volume, and all the basics of drawing and painting. Subjects: Still Life, Landscape, Animals, Flowers and Fruit. Navigation: French site. Main Menu remains available on top once you enter site until you open a gallery, then you must use the retour or the usual return button. Gallery: Under the link Galerie you will find Still Life, Landscape, Religious, Animals, Flowers and Fruit, Portraits. Image view: All images are displayed on the relevant gallery page, and indicate title and dimension when framed. They cannot be enlarged further. The poppy image downloaded at 2240x1680, 1.26 MB!